In the study region, using our meteorologically designed scale and orientation, we find that transmission affects output by reducing variance, slowing the rate of change, and, during the study period, eliminating hours of zero production. The result is that electric power from wind would become easier to manage, higher in market value, and capable of becoming a higher fraction of electric generation (thus more CO2 displacement). You can see that there are stormy days in November when the entire hypothetical array of wind farms is producing at pretty much full capacity, and the capacity factor of the whole system is over 0.9. Then there are calm days in May when there's not a whole lot of wind and the capacity factor is down near 0.1. A 10x variation in power output doesn't seem like something to boast about too loudly. As you can see, with a big enough high off the coast there can be hardly any wind up or down the whole region. There are several important points of context to make however. The first good news is that clearly east coast solar would tend to counter swings in east coast wind to a significant degree. Windless days of high pressure in the summer are exactly when you'd expect solar plants to be at close to maximum output - whereas the wind can pick up the slack in the winter (solar panels will not be doing a lot of good on those stormy days in November). 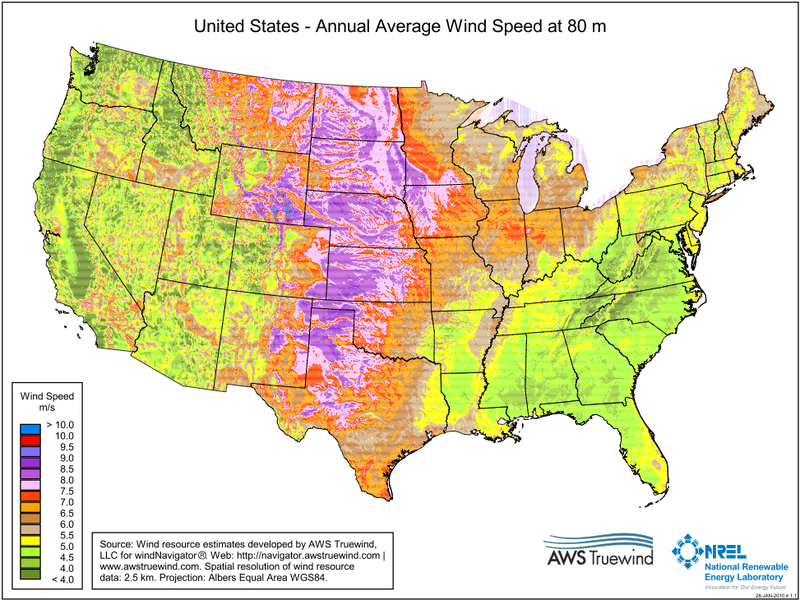 A very important point: the power in the wind is proportional to the cube of the wind speed, so those purplish regions in the high plains have about 10 times the potential per unit area of the yellowish-green regions on the coasts. That's where the wind is. And clearly, by feeding wind into the grid across the US, the performance is going to be smoother again, since a single high cannot cover the whole country. It seems like with renewables, when feeding small amounts into a mainly fossil fuel grid, that's workable as they basically displace fuel use when they are available, but don't displace much capacity so the fossil fuel plants are still there to smooth the renewables out. An all-renewables grid would also be possible, but requires averaging over huge areas (and/or enormous amounts of storage). In between those extremes, things are going to be awkward. 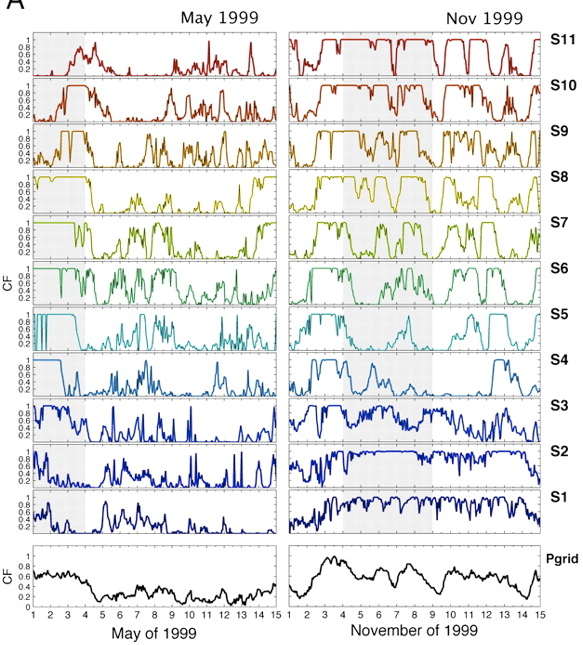 This paper by Archer and Caldeira considers the intermittency problem for the New York area utilizing large battery storage for low wind periods. An available power graph from this wind data would show numbers of dropout days when no power is produced. High altitude wind seems like an intriguing possibility, but it doesn't seem likely it would be much less intermittent. 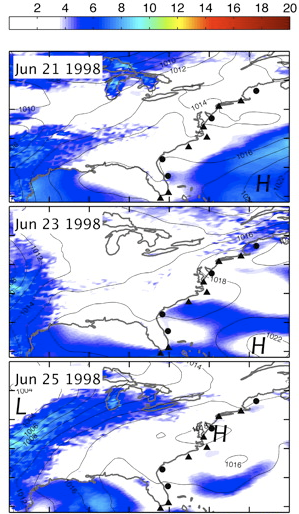 If you are in the troposphere, you'll be subject to the same synoptic scale weather systems creating large variance as at the surface. In the stratosphere, you'll be going after the jet stream, and those are very narrow, very fast, and vary a lot in position. The accompanying graphs show that ~0.7 to 1.5 kW/m2 (depending on transmission distance) are available 99.9% of the time with the 100kWh/m2 battery. So indeed its something to be dealt with, but not a show stopper. The other main issue is that wind peaks in either Winter or Spring. A Winter peak is good, but the Spring winds don't help much if at all. Peak load currently is Summer weekday afternoons when the air is still. Solar matches that fairly well but not exactly. Wind isn't even close. Solar/wind combined helps with the duty cycle, but you still have huge balancing issues--and you are right, the synoptic scale is the proper scale for diversification. 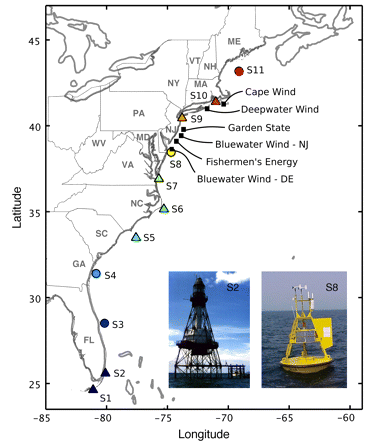 That East Coast thing is too small for diversification and too large to be contained in one ISO--it looks like it crosses 6.
there are stormy days in November when the entire hypothetical array of wind farms is producing at pretty much full capacity, and the capacity factor of the whole system is over 0.9. Then there are calm days in May when there's not a whole lot of wind and the capacity factor is down near 0.1. A 10x variation in power output doesn't seem like something to boast about too loudly. Don't forget, it took 6 months to go from 10% to 90%. 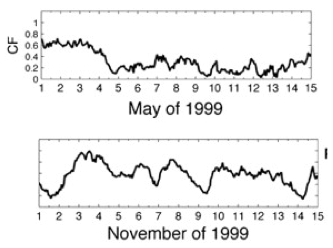 Rate of change is a crucial variable here, and the combined wind power shows much, much lower rates of change. Also, don't forget that all power sources have variability: nuclear has to shut down almost 10% of the time for refueling and maintenance, and when it does it goes to zero output for weeks. Also, nuclear can "trip" with no notice, removing a GW of power at once with no notice, not to return for days. I'm not just picking on nuclear, either: coal has exactly the same issues of maintenance downtime and unscheduled downtime. Grid managers don't need perfectly static sources, they just need them to be manageable. This paper helps make it clear that wind can be just that. A key point: you don't need to have a 100% renewable grid in order to have a nation-wide grid. IOW, you can use high output in Maine to balance low output in Michigan, even if windpower is only 15%-30% of overall KWH market share. 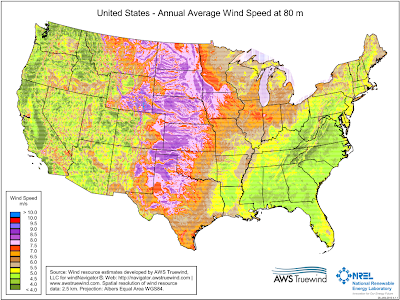 Don't forget Demand Side Management (aka demand response); after geographical diversity, it's by far the most important tool for managing wind variation - much more so than central utility storage. The lower wind's market share, the easier it will be to manage. OTOH, I'd estimate that it could be up to 60% of the grid.